Three comprehensive 240 page books, covering all the best reservoirs, lakes and streams in Tennessee. Detailed contour lake maps, stocking data, plus excellent fishing tips, locations and strategies written by local outdoors writers for each reservoir and numerous streams. A thorough, easy-to-use collection of accurate contour lake maps and up-to-date information to help you enjoy a successful day out on the water on one of Tennessee's excellent fisheries. Of course, the heart of each book is the contour lake map. Maps have been drawn from a combination of the best sources available: United States Corps of Engineers, United States Geological Survey, Tennessee Valley Authority and aerial and satellite imagery. 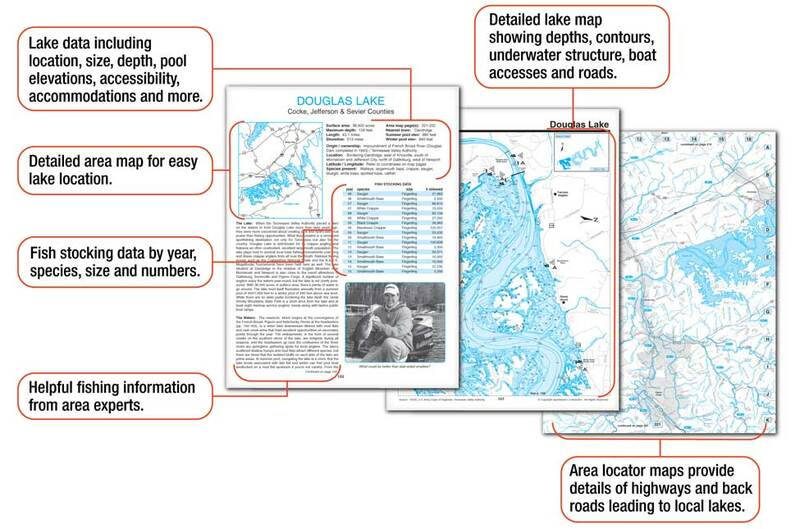 Each of the larger reservoir maps is preceded by a page grid overview, so that you can quickly find any area on the lake without flipping through pages. There is also an alphabetical list of area names; if you're looking for a particular bend or cove, you can find it right away. Each map is accompanied by a detailed write-up by a professional outdoors writer, where you'll find fishing tips and hot spots specific to the body of water you're researching, straight from local experts who have fished the waters for years. On large reservoirs, a table listing all public access sites precedes the lake map. Each access listed in this table includes GPS coordinates, accomodations offered, and a letter identifier with page reference for ease in location on the map. Where available, lake stocking and survey records (courtesy of the TWRA) are shown to help approximate the abundance and/or sizes of various fish species. We've also provided area road maps of the entire state to help you find your way to any body of water. Each lake's data page or information box will refer you to an area map page showing local road detail. Whether you prefer casting flies or fighting river smallmouths, you'll never get bored in Tennessee. The vast network of rivers and streams is covered by watershed, each with a stream map to identify destinations, and a summary of fishing opportunities by a local expert. Survey data collected by the TN Rivers Assessment Project is included in its entirety, so you can see at a glance which streams in your area are the best choice for your quiet fishing get-away, or even a canoe trip for the family. Of course, knowing you'd like to fish Ball Creek and knowing where to find it are two different stories - so we've highlighted and marked each featured stream with a unique number on the road maps. Find a stream in the table on its respective watershed page, and it'll point you to the road map you need to find your way there. Or look at the road map and find fishable streams near the in-law's house, so you can escape during your next visit. Order the print edition today and receive a free, immediate download of the eBook Edition!